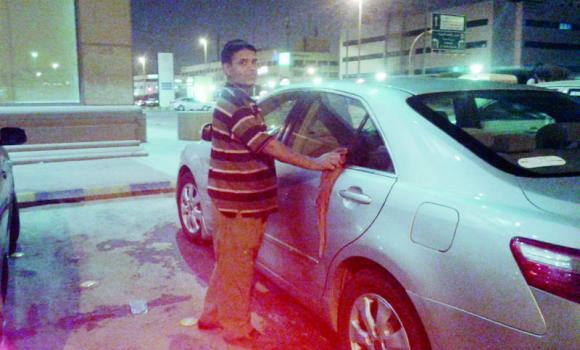 Car wash men continue to enjoy their jobs despite an earlier warning from the Jeddah Traffic Department forbidding residents from accepting car washing services from strangers. Many of these men, mostly Bangladeshi, are illegal residents and take up car washing besides their regular jobs to supplement their income. These expats rush to their usual spots near big commercial buildings, bookstores, supermarkets and restaurants across the city at around 5 p.m. every day. “I could easily make SR700 a month washing cars, in addition to my regular monthly salary of SR700. From this amount, I send SR1,000 to my family back home,” said 40-year-old Muhammed Kamal from Comilla, Bangladesh. He said that he had to augment his income because he had to feed his growing family. Abdulaziz Abdulmalik, 46, from Dhaka, added that his small salary compels him to moonlight, undertaking manual jobs for a fee, including washing cars. Competition among car wash boys has become stiff. Getting a customer has become difficult, so many have devised a strategy. “Two car wash men clean a car and split the SR10 paid by a single customer. This way, they finish cleaning fast, after which they wait for the next customer,” said Muhammed Noordin, also from Bangladesh. What further exacerbates the stiff competition is the fact that customers haggle, demanding services for SR7 or SR8 instead of the usual SR10. “The car wash men agree because of the scarcity of customers and the uncertainty of others coming along,” said Noordin. “This is why it’s not uncommon to see many of them in the streets until the late hours of the night, just before establishments close,” he said. Nour Nobi, another Bangladeshi, said that while they stay on the streets to earn extra money as the night wears on, fear lurks deep down their hearts. “They are in the Kingdom to provide for their families. However, they’re also scared of authorities. If and when they are caught, they will have no one to defend them,” he said. He said that many of these car wash men huddle, talking among themselves, or hide behind trees while waiting for customers so that they are less visible. It’s only when somebody parks his car near a bookstore or supermarket that they approach him, promising a good outcome for a mere SR10, he said.